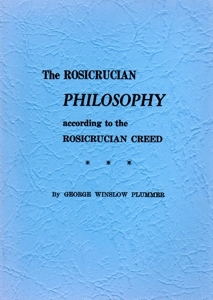 In The Rosicrucian Philosophy (published in 1941), Dr. Plummer has given us 180 pages of answers, logical, lucid and precise to the ques­tions that have been plaguing and gnawing at man through the ages. The Rosicrucian Creed is a summarization of the Five Affirmations, as reduced from the somewhat involved Hermetic Creed. The Affirmations is a simple concise exegesis that is ­broad in scope, tolerant in application and includes all the factors that are so vital to human consciousness, not only for today, but for all time. Many, many changes have occurred in human thought, but none so prevalent and so consistent as those that pertain to man’s—whence, whither and why? Man seeks ever for a reason and an answer to his evolving status, from what to what?